Planting an asparagus bed was one of the best gardening decisions I ever made. Year after year, starting in early March, nutrient-rich spears begin pushing their way through cool garden soil in search of warm sunlight. I’m sure you can guess who is eagerly waiting bedside when the nutrient-rich spears break ground? Every third day, for six straight weeks, I snap off several dozen succulent spears, eating some on the spot — I love crunchy, raw asparagus — and reserve others for the grill, sauté pan or steamer. Following the four- to six-week spring harvest season, I enjoy watching asparagus develop lush, fern-like summer foliage that reaches 4 to 5 feet in height. The beautiful fine-textured foliage creates a perfect backdrop for summer-flowering perennials and annuals. Perennial borders and flower beds are made more beautiful by the addition of a clump or two of asparagus. This long-lived vegetable truly is the poster child for the “edible” landscape. Asparagus is ridiculously easy to grow. I helped a lawyer friend — whose gardening skills are at best modest — plant an asparagus bed some 15 years ago. The 4-foot-wide by 20-foot-long bed faithfully produces loads of spears every spring, more than enough to meet his needs and to share with lucky neighbors. If a busy lawyer with two brown thumbs can grow asparagus, anyone can grow asparagus. Asparagus may be started from seed or crowns. Starting with crowns is the better way to go. You will be harvesting spears much sooner if you start with crowns. Crowns are dormant, 1-, 2- or 3-year-old bare-root plants. I typically see Mary Washington crowns, an old heirloom variety, offered at local garden centers. It’s a good, but not great, variety. Newer hybrid varieties are much more productive than heirloom varieties. One may purchase modern hybrid asparagus crowns online from companies like Starks Brothers, Gurney’s and Burpee. Mail-order companies ship crowns through the end of April. Older crowns cost a little more, but they produce harvestable spears much sooner. Also, I encourage gardeners to plant hybrid male asparagus varieties. That’s not being botanically chauvinistic. Female varieties are slightly less productive than their male counterparts and they set seed, which may require some weed pulling during summer months. Many of the most productive male varieties were bred at Rutgers University in New Jersey. These include Jersey King, Jersey Knight and Jersey Giant, among others. Plant asparagus in sunny, well-drained locations. Start by digging a trench 8 to 12 inches wide and deep. Place crowns in the bottom of the trench and spread roots out flat. Clip and remove any broken or dead roots. Space the crowns approximately 18 inches apart and cover with 3 to 5 inches of soil. As young spears break ground, gradually cover with an inch or two of new soil until the surrounding ground level is reached. Apply a slow-release 18-6-12 Osmocote fertilizer in the spring according to label instructions. This last bit of advice will be tough to follow: Don’t harvest any spears the first growing season. Allow plants to grow and establish a root system. The second year, harvest spears for only two weeks. The third year and beyond, harvest spears for up to four to six weeks. Late February through March is the ideal time to plant asparagus. By Barry Fugatt, originally written for and published by the Tulsa World. Click here to view the original article. Love tropical house plants? Wish they would stop dying on you? Success with house plants begins with plant selection. Some house plant species cling to life and refuse to die despite terrible growing conditions. Others are so finicky they may die during the trip home from the garden center. Here are several low-maintenance tropical plants that cling to life like white on rice. If ever there was a perfect plant for the ultimate brown thumb, it’s ZZ Plant. It came by its unusual name honestly enough. Most gardeners, and more than a few horticulturists, simply could not pronounce its tongue-twisting botanical name: Zamioculcas zamifolia. Hence the abbreviation: ZZ Plant. ZZ Plant is one of the most durable house plants ever. It quite literally can go for weeks, even months if necessary, without a sip of water. The secret to its longevity and toughness may be found in its root system. Just beneath the soil, this amazing plant forms a potato-like root (rhizome) that stores water and nutrients sufficient to survive periods of deprivation — like when you go on an extended vacation and ask your teenage son or daughter to care for your plants. Good luck with that. ZZ Plant also is the perfect choice for a busy office — typically where plants go to die. ZZ Plant is a multistem tropical with glossy foliage and an upright growth habit that slowly reaches 3 feet in height. It’s the absolute poster child for easy-to-care-for house plants. I typically water ZZ Plant every other week. I honestly can’t remember the last time I fertilized it, probably never. I’ve enjoyed a decades-long relationship with this tropical beauty. While not quite as foolproof as ZZ Plant, Bromeliad also deserves high marks for ease-of-care. Its exotic good looks (gorgeous variegated foliage) sparkle in virtually any environment, including low-light conditions typically found in many homes and offices. A weekly watering keeps Bromeliads happy. Travel the road to Veracruz in Eastern Mexico and you’re sure to encounter lots of native Elephant Foot Palms. Despite its name, this tough-as-steel tropical is not related to true palms. Its most endearing features include a bulbous, woody stem that stores water during extended dry periods and its long, hair-like leaves that hang from the top of the plant like a ponytail. It’s thought that this exotic-looking species dates to the dinosaurs. If Elephant Foot Palm out-lived dinosaurs, surely it can endure most office and living room environments. It easily tolerates low-light interior conditions and infrequent watering. My Siamese cat loves to chew on this plant’s long slender leaves. Not sure if I have a totally weird cat or if this is common cat behavior around Elephant Foot Palms. Southwood Landscape and Nursery in Tulsa is hosting its annual “Tropicana Extravaganza” that features hundreds of new and gorgeous tropical plants. Visiting the showroom is like walking through a lush tropical jungle. Ask to see the three species I’ve recommended in this column. I think you will really like them. I promise they won’t die in the car on the trip home. Barry Fugatt, Director of Horticulture at the Tulsa Garden Center, sits down with Channel 8's Good Day Tulsa to introduce a few plants that make great additions to your garden and will stay alive in the heat of summer. Mike Blake, Education and Marketing Manager, and Cristen Burdell, Event Coordinator, chat with Good Day Tulsa on Channel 8 about events taking place in June. 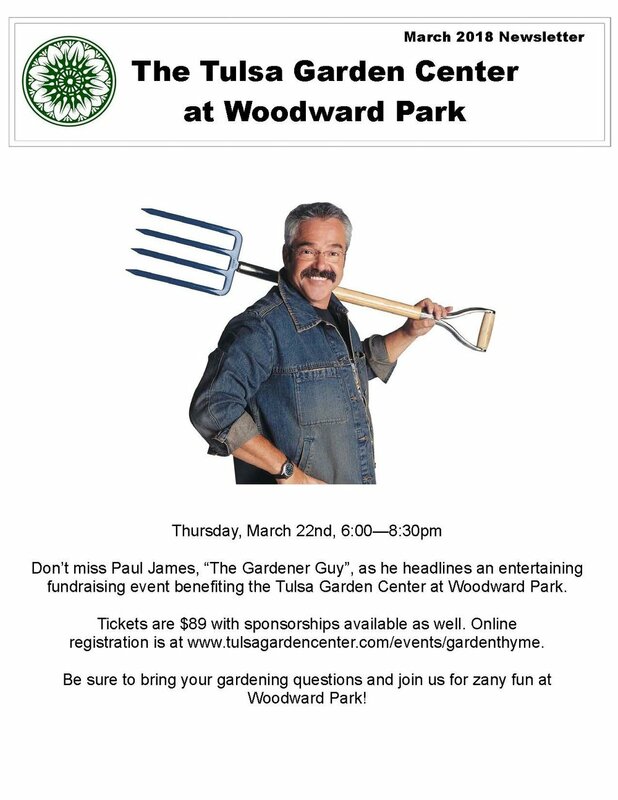 Fox 23's Shae Rozzi provides a quick update on our Rose Garden's revitalization efforts and how the public can help. Channel 2 speaks with Executive Director Laura Chalus and Director of Horticulture Barry Fugatt on the Rose Garden's recovery process. 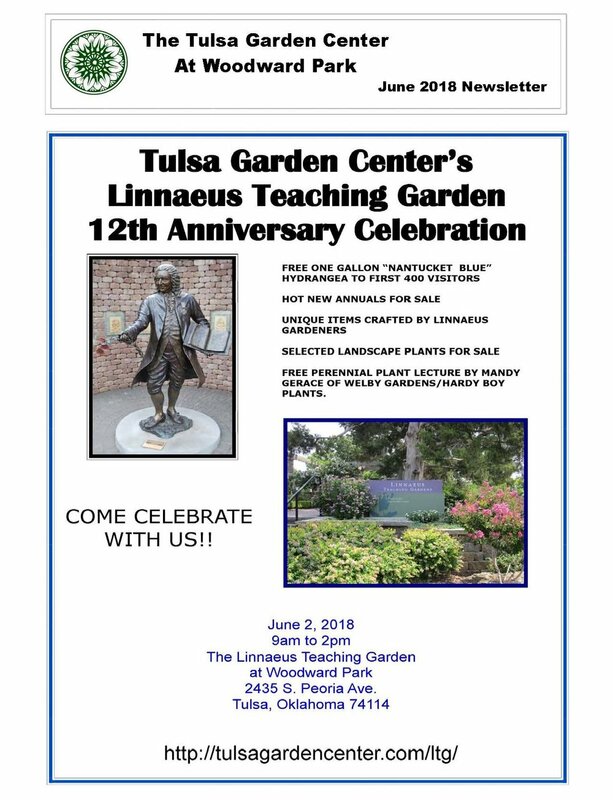 Explore Tulsa interviews Pam Snodgrass, Children's Chair Person, at the Linnaeus Teaching Gardens about children's programs that are offered. Laura Chalus, Executive Director, and Cristen Burdell, Event Coordinator, chat with Good Day Tulsa about our Craft Beer Tasting event, sponsored by American Solera, as well as our Hypertufa creation class. Channel 2 profiles the Linneaus Teaching Gardens and how the public can support the programs and classes that are offered. Channel 2's Ashley Holt covers the Garden Center's efforts to revitalize the Rose Garden. 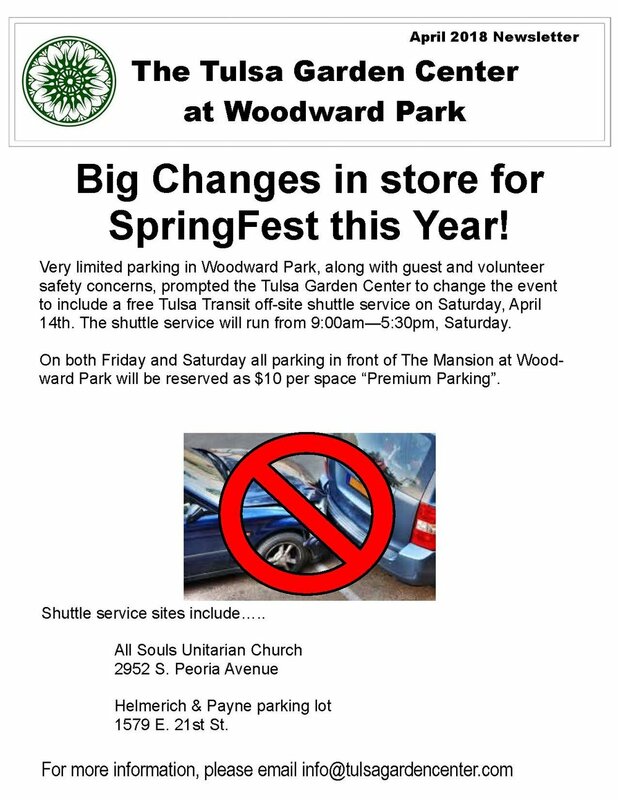 Rick Wells from Channel 6 visits Woodward Park and the Linnaeus Teaching Gardens for the perfect spot to relax in Spring. 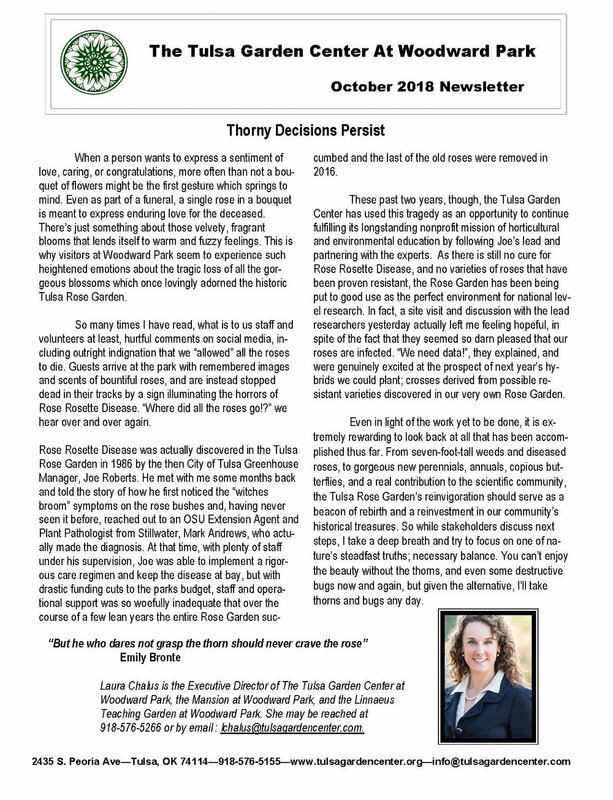 Fox 23 speaks with Mark Linholm of the City of Tulsa about Rose Rosette disease - the incurable virus that has decimated the Tulsa Municipal Rose Garden.